The letter, astonishingly, says they can't make ice until there are three straight days of 5 degrees or lower in daytime, 0 degrees or lower at night. Tech staff came to get propane supply line ready and bring salt, check compressors. showing that ice was made at higher temperatures for two of last three years. Sent a table of temperatures during ice-making (as high as 11 in the day and 8 at night) and floods for 2009 -- ice was skateable after 5 nights of floods, some done by volunteers. The letter also linked an interview with the city's refrigeration contractor, CIMCO, saying that the compressors are good at making ice even if it's 10 degrees at night-time. 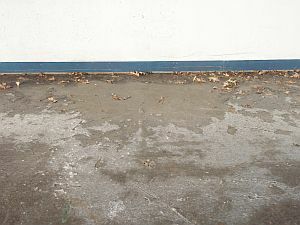 Rink surface has been cleared of leaves. 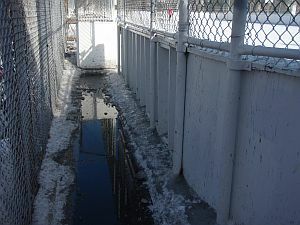 Compressors were turned at at 11 a.m. Two test patches of water (one bucket on each rink pad) froze in half an hour at 9 pm. Two more buckets put on at 11 pm. 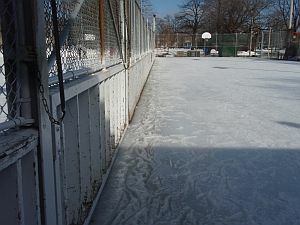 Rink is covered with white rime. 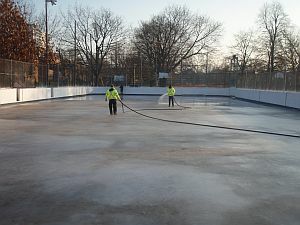 Two more buckets of water put on at 8.30 a.m. Rink supervisor came by --said they have to wait 24 hours from start up to start putting down water -- staff are scheduled for evening floods on Wednesday night (i.e, not until more than 48 hours from compressor-startup). He also said that the sun and 10-degree temperature is too big of a challenge this week, ice won't work out well. Said that Harbourfront tried opening but had to close. We checked with Harbourfront -- they said they never had to close. 1.30 pm: 9 degrees and sun -- some of the test patch was slush, some still firm. Half the rink still covered in rime. 6 pm: test patch solid again. Added two more buckets of water. 9 pm: added two more buckets of water. They froze solid in half an hour. Fog hovering above the slab surface. Heavy rime all over. 11 pm: Added two more buckets of water. 6 a.m. Foggy everywhere. Added two more buckets of water. Freezing fast. Heavy rime on rink surface. A City vehicle was parked outside -- gone five minutes later. 7.15am: Ice test patch solid. Added two more buckets of water. More water added at 8.30am. Test patch getting thicker, still solid at 3.30pm despite the sunshine. More buckets added at 9.30pm. Rink maintenance staff arrived at 10.30 pm to start flooding. 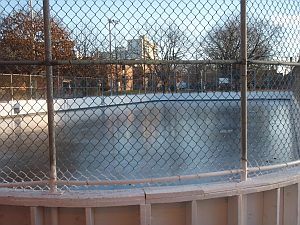 5 a.m.: Rink had a layer of ice on it. No staff in sight. 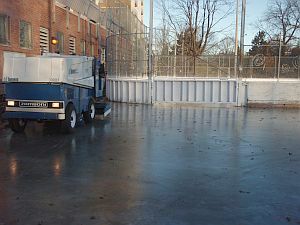 8 a.m. Five rink maintenance staff arrived to flood the rink and lay out rubber mats. 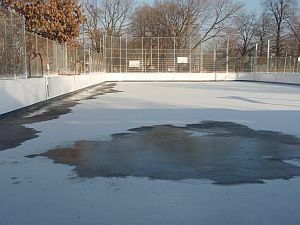 3 pm: most of the rink is puddles and cement, except for the test patches, which have good ice covered with a thin layer of water. Just like at Harbourfront. Their webcam shows some skaters, but there's water on top of the ice. Who cares? In a few hours it will be set again. 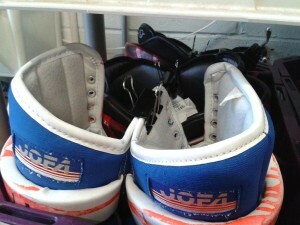 A young skater put on her hockey skates to try out the test patches. Her first time skating this year. Everybody going by the fence stops to watch. Ice very thin in the morning. Staff come back to flood some more at 10.30 pm. Say they plan to put down four more floods. Ice very thin, goes back to cement in lots of places. Test patches are holding up fine, though. Staff come in to flood again at 8.00pm. Two floods put down before 11 pm. At 8 a.m. the zamboni is just coming off the hockey ice to fill up with more water. 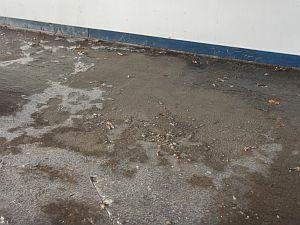 The rink supervisor is non-committal about when the rink will open -- "we're going to try and get down another layer of water." Good idea. 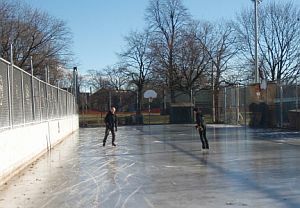 At 9 am the rink opened. 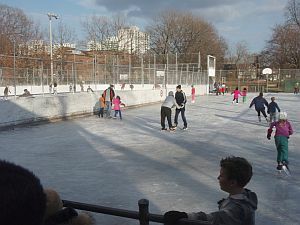 The ice is not thick so it may not last into the afternoon, but for now, there are lots of happy skaters. cell phone magic: how did everyone know so fast? 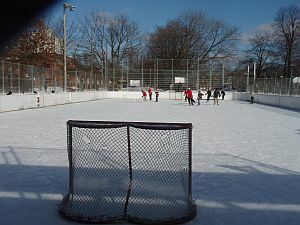 At 1 pm the ice is so cut up that the rink has to close down, at least for the afternoon. 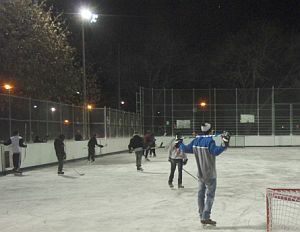 At 5.30 the rink reopened, after several more cold floods from the zamboni. Skaters stayed away from the edges where the cement was. 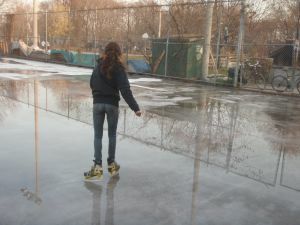 The ice was very pebbly because of the cold floods -- lots of jokes about having to go out and get skates fixed. The snack bar was closed because of the staff shortage, and the youth were hanging around and yelling at/to each other. Hard to know where this will go from here. The zamboni operator did some back-to-back floods beginning in the evening, building up the ice and then switching to hot water floods to smooth it. He finished at 11.30, saying, "now it's just perfect." And it was. 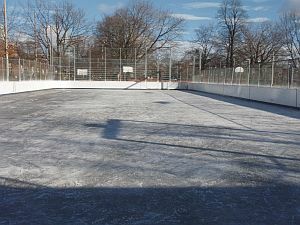 The ice is MUCH better than yesterday, after the zamboni operator put down all those extra layers of water last night. A lively family scene all day, with a fire in the wood stove inside, and lots of people coming by to borrow skates. 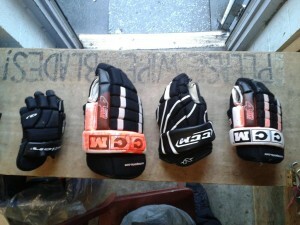 Today is the market at the rink. Its the first day that the snack bar will open at the rink since opening day on Nov 24th. Opening week is usually one of the busiest times (apart from holidays) and being under new management has meant that a lot is slipping through the cracks. Kids that were banned from the rink last year are not being watched closely enough by the limited staff, and none of the restorative justice that staff normally organize (like doing the dishes for 4 weeks because you stole the rink keys !!) is happening. Still the market ran. Right after, some youth that don't normally come to Dufferin broke the windows of a car. The youth who owned the car was part of a group that punched another youth who might have known the car window smashers. Staff dispersed the situation - but its far from being dealt with. 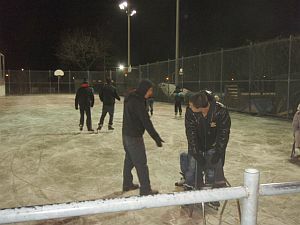 At 9pm - the rink was a mess. The usual litter build up, bag of chips spilled on the floor, kitchen sinks full of half drunk hot chocolate cups and full garbage bins. What you would expect when a place is evacuated at the end of an afternoon. It sounds like 2 fuses had blown on one of the ammonia pumps which caused pressure build up and the leak. Just after 8pm, the problem had been fixed, fuses replaced, but smell of ammonia was still lingering around the place. Parks supervisors said it still smelled pretty strongly of ammonia in the garage where the zamboni is, so the evening operator was rerouted to lay mats at Wallace Emerson. Only problem was, the usual many mats for Wallace rink were nowhere to be found. 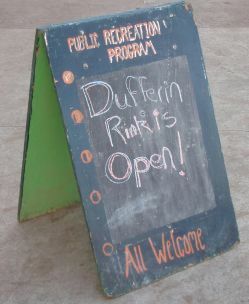 So that meant, that neither did Wallace get mats laid, nor did Dufferin get any ice maintenance after reopening at 8pm. By 9:30, the smell of ammonia had completely dissipated. 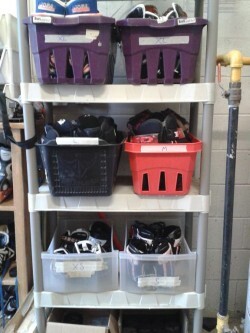 The skate rental room was full of skates returned in a hurry (all over the floor). And the one staff was writing a report on the evening, trying to figure out where to start on the massive amount of clean up that would normally need 4 staff. 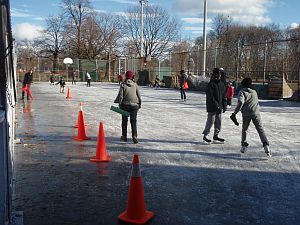 Tomorrow's recreation staff are going to have their hands full on a busy weekend day, with so much to clean up, and Councillor Ana Bailao's annual skating party. Tonight there were three staff on site. 2 brand new inexperienced staff, and one coordinator. A complaint came from some youth that a father was harassing them, spitting and pretending to have a gun in his pocket. The youth said that the father encouraged his son to 'get back' at them for saying some comments on the sly earlier in the evening. One youth said he go spat at, another said he was punched (lightly) and another got a slap. What is scarier is that - no one saw this, and it happened right in front of the snack bar - on the bench that so many lounge on, hot chocolate in hand, before taking a spin on the ice. This all happened around 8:30 at night when the zamboni was getting ready to go on the ice - and nobody saw a thing. The zamboni cafe was closed that afternoon shortly after 5pm. The three staff working were occupied with the zamboni, skate lending, and another in the back of the rink house. Usually we have two strong staff working every night - staff that know the importance of having your eyes on the rink, on the building and the people inside. Staff who listen for swear words, the nervous laugh of a thief, the edgy voice of a person getting ready to throw a punch and start a fight, or wanting to return their skates fast because the cops are coming. To the end of February, food-and-skate-loan income in the rink season has been $18,000 less than in the rink season last year. No surprise -- so much has been dismantled. It was sunny most of the day,. and even though it never got above -1, the ice was bad by 3 pm. 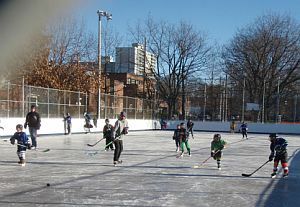 Park management has decreed that the rinks should try to stay open until March 15 -- as if.